Between 2018 and 2019, the Economic and Financial Crimes Commission (EFCC) recovered N236 billion from tax, subsidy payments and banks, in addition to over N13 billion in the first quarter of this year. This is coming as the agency has decried poor budgetary allocation, which it said had hampered its growth and operations even as it secured 507 convictions within the period under review. A statement issued by the agency in Abuja detailed statistics of its recoveries, budgetary performance and declining budgetary allocations presented before the National Assembly during a budget defence by its Chairman, Ibrahim Magu. EFCC stated that “in the area of recoveries, N11.5 billion was recorded in final forfeiture, N133.8 billion in non-forfeiture recoveries, N8.92 billion in direct deposits, N38.12 billion in tax recoveries, N1.82 billion in subsidy recoveries, and N42 billion from banks (Third Party), totalling N236 billion”. Within the first quarter of the current year, 2019, the commission, he said, made recoveries which included: N140.7 million in cash, N2.021 billion in direct deposits, N7.20 billion in tax recoveries, N3.06 billion in subsidy recoveries and $0.292 billion. In his presentation, Magu lamented that incomplete releases of both approved overhead and capital estimates, have in no small measure, negatively impacted the ability of the Commission to meet its pressing needs and obligations. He noted that only 54.17 per cent was released in 2018 while only 40.06 per cent of capital has been released so far with only two and half months to go to the end of extended 2018 capital budget year. This year’s figure represents a 16.38 per cent decrease from the 2018 budget of N26, 392,396,279.00, and a rise of 14 per cent in the personnel cost proposal from 12.717 billion in 2018 to 14.491billion this year. The increase in personnel cost according to Magu, accommodates the salaries and allowances of 970 additional staff (currently being trained at the Nigerian Defence Academy, NDA, Kaduna), who are expected to be fully enrolled on the personnel cost platform in 2019. The additional staff, he said comprised 332 Assistant Detective Superintendents, 293 Assistant Detective Inspectors and 95 support staff that recently joined the Commission. 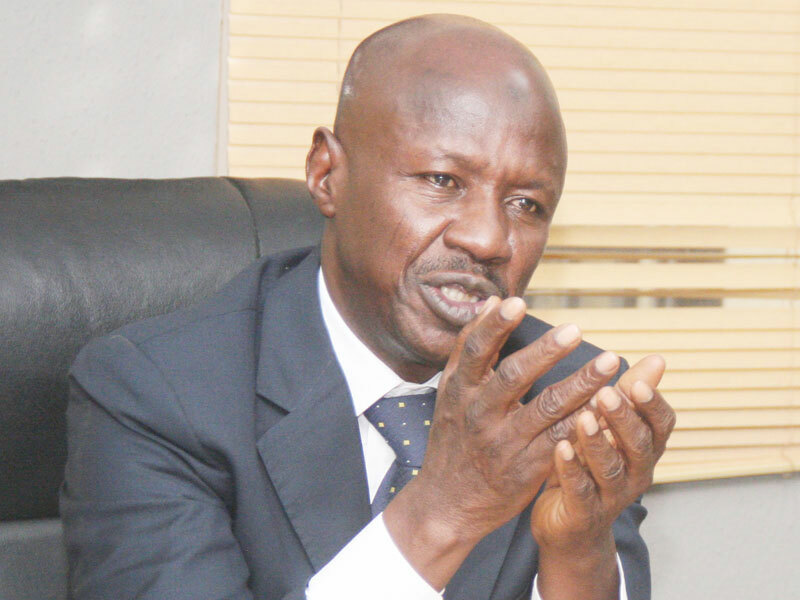 Magu expressed grief that the EFCC’s overhead cost which the Budget Office reduced from N7.3billion to N3.6billion was grossly inadequate for the Commission in view of the increased running cost, occasioned by developments such as the opening of three additional zonal offices, planned introduction of group staff life insurance of N650 million, huge outlays on generator fuel cost, increase in airfares, proposed 60% increase in the rates of duty tour allowance (DTA) payable to staff on official assignment. The EFCC boss equally expressed worry over the Budget Office’s drastic reduction of the Commission’s capital expenditure proposal from N15.196 billion to N3.978 billion, representing a 74.82 per cent reduction from the approved estimate of N10.07 billion in 2018. He sees the approved capital budget expenditure as inadequate in the face of the commission’s N2.02billion outstanding liabilities to Julius Berger; N1.5 billion cost runs on its new head office complex; N0.299 billion liabilities for consultancy on new head office; N0.47 billion for purchase of security equipment (ammunition); N1.1 billion on furnishing of new head office building; development of the permanent site of the EFCC Academy, Lafia; renovation of the old EFCC head office building, Wuse 2, Abuja, and the renovation of the Lagos Zonal Offices (10 Okotie Eboh and 15 Awolowo Road. The anti-corruption boss disclosed that the 2018 budget witnessed an increase in the personnel cost of the Commission from N7.6billion in 2017 to N8.5 billion, which were the consequences of the full enrolment of 314 Assistant Detective Superintendents and same for 183 Assistant Detective Inspectors following the completion of their training programme in May and January 2018, respectively. Others are: the completion of the Commission’s Jabi District, new head office complex and relocation, the establishment of three new zonal offices in Makurdi, Sokoto and Ilorin, the hosting of Heads of Anti-corruption Agencies in Commonwealth Africa (HACA) in Abuja in May, last year. Other activities within the period under review include the anti-corruption concerts hosted in Abuja, Kano, Lagos and Enugu as well as the first ever anti-corruption marathon that drew out hundreds of marathoners from across the country, civil society organizations, and sports celebrities; acquisition of hectares of land in Nasarawa State for the construction of the permanent site of the EFCC Academy, of which its development is expected to commence this year. Magu disclosed that in the course of the 2018 financial year, the EFCC obtained 315 convictions, and has within the first three months of this year, obtained 192 convictions. In the area of recoveries, he said N11.5billion was recorded in final forfeiture, N133.8 billion in non-forfeiture recoveries, N8.92 billion in direct deposits, N38.12 billion in tax recoveries, N1.82 billion in subsidy recoveries, and N42 billion from banks (Third Party), totalling N236 billion. Within the first quarter of the current year, 2019, the Commission, he said, has made recoveries which included: N140.7million in cash, N2.021billion in direct deposits, N7.20billion in tax recoveries, N3.06billion in subsidy recoveries and $0.292billion. He disclosed that the commission was challenged in the areas of huge maintenance cost of the new head office building; inadequate resources to manage a huge and growing fixed asset forfeiture base and inadequate ICT infrastructure. Magu noted that “there is presently the complete absence of internet services at the New Head Office and zonal offices, including other related ICT service deliveries”. The commission, he disclosed, requires a minimum of N800 million to upgrade its present state of ICT infrastructure. This he said, is in addition to a proposal to Salaries, Income and Wages Commission for an upward review of salaries and allowances of the staff of the Commission. “This has been forwarded to the Presidency and, if approved, will be covered by Supplementary Appropriation,” Magu said. Other challenges according to him are: poor detention facilities, particularly in the zones, inadequate office equipment, absence of health and fitness facilities in the head office and zones, lack of equipment in the clinics and inadequate office accommodation in the zones. The commission’s zonal offices in Ilorin, Makurdi, Uyo and Benin, he said are rented, adding that there is also the pressing challenge of inadequate operational vehicles in the head office and across the zonal offices. In his response, the Chairman, House Committee on Anti-corruption and Financial Crimes, Hon. Kayode Oladele who led other committee members, described the 2018 budget performance of the commission as a huge success. Kayode and other committee members promised that, the committee will support the anti-graft agency in any area it needs parliamentary intervention in its drive to achieve a better performance and outcomes.